There isn’t too much info on Local Proxies that you can find on the internet. They also don’t disclose a lot of details regarding their proxies. The number of available IP addresses is unknown and they claim to have IP addresses in thousands of cities in almost every country in the world. To verify their claims, today we will be reviewing them to see if they are really as good as they claim to be. Local Proxies is a company that isn’t on the top of the popularity list. Which is not surprise, as far as we could see, the company is not very exposed. Regardless of that, we purchased a few proxies from them and put them to the test so that we can see if they are worth it. The company’s history is something that we haven’t been able to find on the internet. The details in regards to their proxies are also something that they don’t disclose, but they do have some claims. The IP pool is unknown, but they claim to have proxies in thousands of cities around the world. They also claim that they constantly update the IPs and that they are 100% undetectable. And best of all, the proxies are from multiple providers, which means that they are random. Being a company that only sells residential proxies, people might think that they have a handful of packages. Wrong. Local Proxies have divided packages into several segments. The first segment is by rotation type. You can get two types of proxies – ones that rotate every 10 minutes and ones that rotate with every request. Each one of those has 3 sub-types: International, European, Premium. The international rotating proxies that rotate every 10 minutes have eight packages. These offer random IP addresses with no option for geo-targeting. 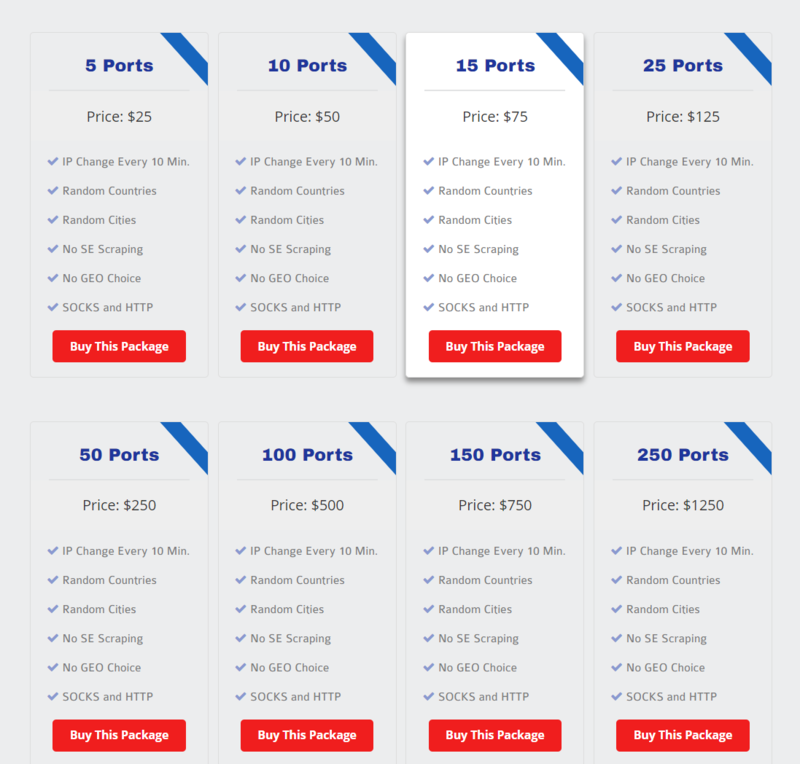 The only difference is in the number of port that you get the number of ports. Location-vise the proxies are random form all over the world except Europe, US, CA, UK, AU, NZ. Compare the Price of residental proxies to stormproxies and microleaves, They offer same type of backconect proxies are charging by ports! Next are the European proxies that rotate every 10 minutes. For these proxies you get IP addresses from random cities throughout Europe and the plans differ depending on the number of ports that you need to get. For the European you can also use the geo-targeting feature. The third static type of proxies is the premium. These cover the locations that are excluded from the international proxies. That means that you get IP addresses only from US, CA, UK, AU, NZ. You get premium geo-targeting and random cities in these countries. 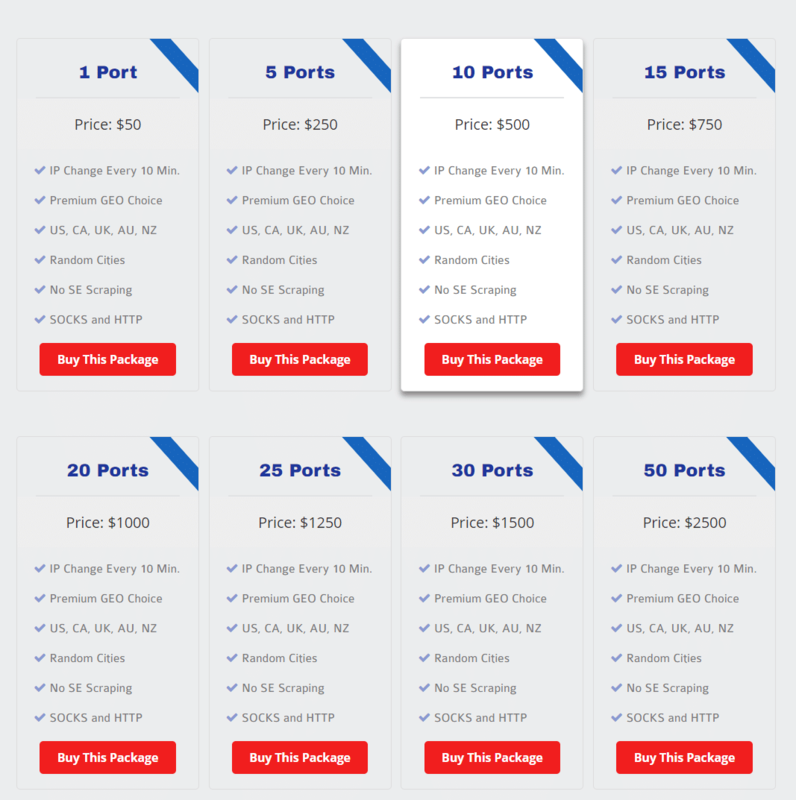 Same as the previous two types, the only difference between the packages is the number of ports that you get. The second type of proxies is the rotating ones. They rotate with every request. Similar to the sticky, there are three types of rotating proxies: International, European and Premium. 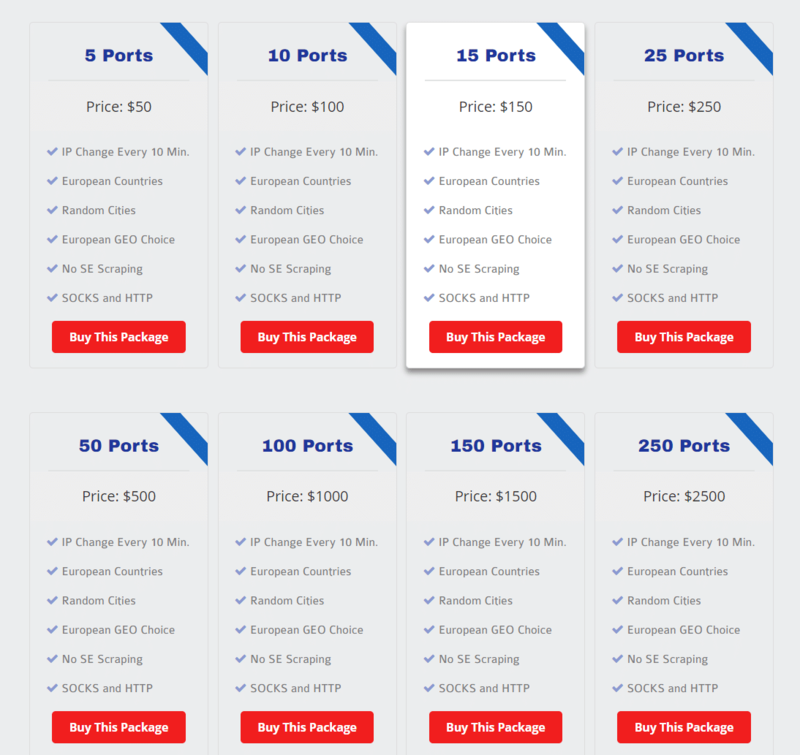 Every pricing package depends on the number of threads. The international rotating proxies cover proxies from random cities and countries except Europe, US, CA, UK, AU and NZ. You also don’t get the option to target specific locations. The European rotating proxies provide you with proxies from Europe with the ability to geo-target. The countries that don’t cover these packages are US, CA, UK, AU and NZ. The premium rotating proxies offer IP addresses only from US, CA, UK, AU and NZ that allow geo-targeting. Unlike some of their competitors, Local Proxies doesn’t provide a list of countries where they have proxies. Based on the packages, they have proxies in Europe, US, CA, UK, AU and NZ and some other countries that they don’t disclose. The ability to geo-target is a plus. Companies that sell proxies often make some bold claims in regards to speeds that the proxies have. Local Proxies are no different. They claim that their proxies are fast and secure. To verify that we purchased several proxies from them and put them to the test. We tested the time it takes for the data to reach a server and go back to the host – the latency or ping and we tested the amount of data that passes through the proxy – the speed. First, we did a controlled test on our VPN to have something to compare the results to. The results are excellent. If we take into consideration that these are residential proxies, they are mostly limited by the connection speed of the host. Local Proxies’ IPs have speeds that put them to the top of the list. Thumbs up for that. Having a bad proxy means that you will likely be discovered by the service you want to access. To see if Local Proxies’ IP addresses are indeed from the location that they claim, we ran the geolocation test. The results should not surprise anyone. Residential proxies in general are always good IPs and in this case all of the tested IPs are good and are from the US. The real test is the compatibility test. This enables us to put the proxies up against some of the strictest sites that are good at sniffing out proxies. If we use bad proxies, then we will not be able to access these services. Again, these are the results that we should expect from residential proxies. All of the tested IPs were able to access the sites that we tested them on. Some companies offer all kinds of proxies for every occasion. Local Proxies only have residential proxies meaning that you will not be getting data center proxies. Local Proxies make daily checkups of their proxies and remove the old and add new ones. Apart from being bale to target specific country or city, Local Proxies’ flags offers coordinate targeting. If you’ve never used a proxy service before, Local Proxies might be a good choice. The dashboard is easy to navigate and applying the proxies are as simple as you can get. If you intend to use their proxies for browsing, with not additional settings, then all you will need to do is set up the proxy address to “proxy.localproxies.com” and the port to “700”. For using the SOCKS protocol the address is the same and the port number is “600”. This provides the basic settings. For advanced users you will need to use Local Proxies’ flags. They have serval flags available which you can set up for your proxy. C – Country is the flag that you would use for geo-targeting a specific country. ISO country code required. CI – City if the flag for geo-targeting a specific city. If you use the city flag, you must use the country flag as well. RG – Region is the flag used for targeting a specific region within a country. This must be used with the country flag. SE – Service name flag is a value that you receive in an email when you purchase a package. This is a mandatory flag. T – time is a flag used to adjust how long to keep the same IP active. You can add s (second), m (minute), h (hour), d (day), w (week), mo (month), y (year) to let the server know how long to keep the session active. Setting the time flag to 0 will keep the same IP as long as possible. S – Session is the flag used to assign a specific IP address to a specific session. Use this if you want to use a specific IP address in a future session. LO, LA – Longitude and Latitude are flags for geo-targeting specific coordinates. DT – time since last domain access is a flag used to specify the minimum time since a certain IP address was accesses on a certain domain. RE – test that eliminates non-residential IPs. The usage is “RE-true”. At this point Local Proxies offer only IP whitelist. This is for situations where you intend to use their proxies on a browser. If you are using the flags system, then the authentication process is a combination of IP whitelist and a username. To whitelist you IP first you need to log in to Local Proxies’ dashboard. Navigate to the “Proxy Ports” section and in the bottom part you will see “Allowed IPs”. The service reads your current IP address, so if you want to add that one, all you need to do is click on “Add current IP”. Alternatively, you can enter the IP address, or multiple, in the text box and click “Update”. Every time we review a proxy provider, we tend to be sceptics for their claims. It was the same situation with Local Proxies, but they managed to surprise in certain aspects. The IP pool is unknown and the lack some features that other competitors have, but the speeds and latency of their proxies is excellent. The basic usage of Local Proxies’ IPs is easy and simple to master. That is if you don’t need some advanced settings. If you do, then the flags system will provide you the flexibility, but there are a few rules that you need to keep in mind when using them. Comparing prices between several proxy providers is never easy. Each one offers specific pricing plans and specific features that the others don’t. in general, Local Proxies’ pricing plans are somewhere in the middle, not too expensive, not too cheap. Local Proxies claim to have stable and fast proxies, which we can verify. None of the addresses had any problems and the speeds were excellent. If we put aside some features that they are missing, then they are a good proxy provider that we can recommend. This is one of those segments that Local Proxies need to work on. At this point the only way to reach support is via email. Their social media accounts are either inactive or non-existent. To top it all off, their contact page doesn’t work, so you would have to send them an email. Our opinion on this is to hope that you won’t need support. It is a love and hate situation with Local Proxies. There are some things that we really like and others that we don’t, which is why we can’t say that you should or shouldn’t get proxies from them. The thing that we can say it was good was the speeds and geolocation test of the proxies. They performed admirably and combined with the prices, they would be a good choice. The flags system for advanced usage of the proxies is somewhat complicated, but you can get the hang of it. The poor support options are something that might get you thinking. In general, Local Proxies is not one of those companies that we tell you to stay away. The fast proxies, combined with the easy to use dashboard and setup should be a good choice.